Hard Target (OPSIG Team Black Series Book 2) - Kindle edition by Alan Jacobson. Literature & Fiction Kindle eBooks @ Amazon.com. After an assassination attempt on the president-elect, the OPSIG team is on the hunt in this “terrific thriller” from the USA Today–bestselling author (Lee Child). 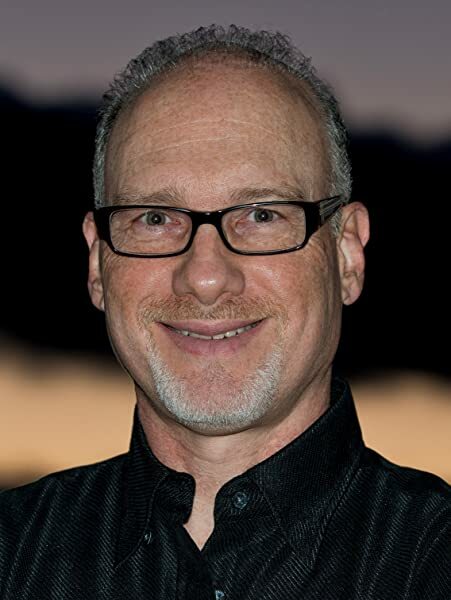 My literary career has been marked by a number of events, none more significant than an accidental meeting 20 years ago while researching my first novel, "False Accusations," at the California Department of Justice's crime lab. I started chatting with FBI agent Mark Safarik, a profiler at the FBI’s Behavioral Analysis Unit, and Agent Safarik subsequently invited me out to Quantico to tour the Academy. My immersion in the world of serial killers, rapists, bombers, and arsonists was off to an eye-opening start. Over the course of seven years, I’d made numerous trips to the BAU, had countless hours of conversations with Agent Safarik and his partner, attended FBI training courses, shot submachine guns with the Academy’s head firearms instructor, edited four published FBI research papers on serial offenders, and parsed serial killer interviews with Agent Safarik. I was finally ready to write my third novel, the first featuring FBI Profiler Karen Vail—the national bestseller, "The 7th Victim." Oozing sharp wit and sarcasm, Vail means well but, like you and me, makes mistakes. Despite being a skilled profiler, she suffers unease about the decisions she makes because lives are on the line. Errors prove costly. Vail has resonated with hundreds of thousands of readers because she's real. The head of the Federal Law Enforcement Officers association described Karen Vail as “a cop you'd go through a door with"—a phrase used to describe a colleague with whom officers trust their lives when bullets are flying. Vail directs the action in "The 7th Victim,” “Crush," "Velocity," "Inmate 1577," and the short story “Fatal Twist.” She also has a meaty role in “Hard Target,” which brings back enigmatic covert operative Hector DeSantos (who debuted in my second novel, “The Hunted,” and who partnered with Vail in “Velocity”). My years of research and training with the FBI, DEA, US Marshals Service, Scotland Yard, and SWAT have shaped the stories I tell and the diverse characters that populate my novels. So sit back, crack the spine--or swipe the touchscreen--and immerse yourself in the gripping world of Alan Jacobson thrillers. Finally, FBI profiler Mark Safarik and I co-authored a 23-page personal safety booklet that’s available free on my website, AlanJacobson.com. It'll help you and your loved ones stay safe by avoiding the crosshairs of violent criminals. And be social--follow me on Facebook and Twitter. See you in cyberspace! 4.0 out of 5 starsHard Target is an excellent way to spend a quiet day. OK, this book is really, really fast paced. In case you are unaware of how fast paced it is the author heads each "chapter?" with hours to go before a big conference. I hated, HATED the death of the psychologist/psychiatrist. I don't think it added anything to the book or the plot or the character development. Uzi, for someone who was, at one time. an undercover black op in the Mossad, is probably the dumbest most incredibly not paying attention to what is going on. I figured out the broad was a "plant" the first time he slept with her and then "discovered" the tracking device. And he could NOT figure out where it came from. The ONLY time he had his clothes off was when he was sleeping with her. DUH. Uzi allows his past to totally disrupt everything he is doing. He spends so much time cranking around about whether or not this or that is "legal" or whether or not someone is going to be upset, that half the time I just want to slap him upside the head and yell "get over it." Now having grumped about that, this book is really good. It isn't going to go where you think it is going. And the scenario that Jacobson sets forth is scary. That having been said, the comments about the "militias" are more like a "Democrat vision of how to justify more laws." I started this book, evidently in the middle of this group's "adventures" and have now ordered all the other books. Jacobson's writing is crisp, effective, fast [hold on] and almost believable. His characters are not Vince Flynn's type of agents. And Jacobson does spend too much time making it seem that people get things done in spite of themselves. but somehow they do manage to stumble into the right course of action. So, if you like fast, fascinating, devious, and surprising then Jacobson is for you. These are books you read for fun. And they are a lot of fun. I wonder if Jacobson is out of breath as he writes these books. I am a huge fan of the Alan Jacobson series featuring profiler Karen Vail. 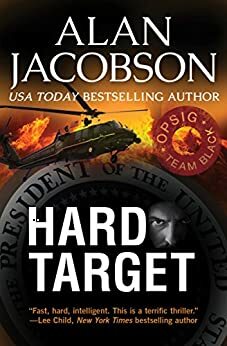 I was looking forward to reading Hard Target, although I knew that Karen was more of a secondary character in this novel. However, I didn't like this as much as I had hoped. The story follows Agent Aaron Uziel, who goes by the nickname of Uzi. Uzi lost his wife and daughter while he was a member of the Mossad in Israel. He returned to the States and started working for the FBI. He and his partner, Hector DeSantos, are investigating the attempted murder of the President-elect. 1. There were just too many characters. Some had real names, some went by code names; either way, there were just too many. 2. Many things were easily figured out by the reader, but not the characters. No real surprises until the very last page, because it was easy to figure out. 3. One of the bad guys showed up in the beginning and then didn't come back until near the end. By then, I'd forgotten about him and who he was. 4. Not enough Karen Vail. Is this better than a lot of books out there? Yes, it is. But it just wasn't Alan Jacobson's best. 3.0 out of 5 starsFast paced, maybe too fanciful at times. This could have been a five star book. The story line was gripping, the good guys might be bad guys, just when I had it all figured out, I was wrong. I hate when an author throws in some nonsense that doesn't add to the story. In this case, he has a character expound on how illegal guns are bought and sold at gun shows by leg imitate dealers who sell "under the table" as private citizens. Many, many guns. I actually read the acknowledgements to see who advised him of that tidbit. He has plenty of experts, but none on gun shows. It's a common misconception, one that's promoted over and over by people who've never been to gun shows. First, if it's so common, don't you think the ATF would pose as buyers at gun shows? I'm no expert in FBI matters, but I do know firearms, and his blatant throwing gun shows under the bus is 100% hogwash. I've been to many. Once I got past that, the story was fast paced. You'll probably have to suspend your disbelief at the end, maybe he ran out of a logical ending. 3.0 out of 5 starsJacobson's prejudices are too much. Didn't finish the book. I was irritated by the author allowing his personal biases to taint the narrative (apparently Mr. Jacobson believes that the Second Amendment is an anachronism and that private gunowners are potential terrorists). Ironic, because all of the books protagonists carry guns. I can sum up Mr. Jacobson's apparent views as government with guns - good; private citizens with guns - bad. Another negative factor is Mr. Jacobson's infatuation with Israel and Jews. While the Israeli intelligence services are good, do you really think that the FBI consults with retired Israeli intelligence agents about domestic terrorism? In Mr. Jacobson's world, it appears that the majority of smart, tough, beautiful people are Jews - the uglies are all Christian. Not a bad book if you share Mr. Jacobson's prejudices. 4.0 out of 5 starsGreat story. Author always does his research and asks questions and his background helps him write great books. If the all alphabet soup agencies don't share the full story with each other, how do they expect to find the solution to problems? Fire arms, detailed description of difference between Russian and U.S. made bullets and loopholes in gun sales. Israel and Palestine talks, home grown militant groups, double agents, hacking and not good careful vetting of personal that works for our safety. Many twists keeps you at the edge of your seat.